어항 내 魚적 청산 후, 혈앵무와 레드쥬얼 (씨클리드 일종) 각 한 마리로 새 출발 했다. 물 잡고 입수한 후 이틀 만에 펑거병 발병하여 혈앵무의 지느러미가 썩는 것이 확인됨. 이런 된장! 하나에 만원 주고 산 물고기가! 물 생활 5년차에 세 번째 겪는 펑거병. 처음에는 어리바리 아무것도 몰라서 어항 전역을 초토화 시켰다. 두 번째는 수족관 사장님 조언을 바탕으로 치료 시도하였으나 실패! 다행히 초토화되지는 않아 생존 魚를 중심으로 새 출발. 삼세번이라고 이번에는 성공한 것으로 보임. 펑거병 걸리면 물고기가 황천길 가는 것은 시간문제. 그냥 느낌이지만 지느러미가 썩어들어가는 속도는 상상을 초월해서 하루 정도만 내버려둬도 지느러미의 반이 날아간다. 상황과 환경에 따라 다르겠지만, 대부분 펑거가 출몰하면 치료를 포기하는 분위기이다. 이번 성공 결과에 비추어 최대한 잽싸게 조치를 취하는 것이 핵심인 것 같다. 현재의 경과는 좋은 편이다. 지느러미 썩는 현상이 멈춘 후에 치료를 중단하고 매일 상태를 점검하고 있다. 지느러미가 새로 돋아나는 것이 관찰되나 썩어들어간 속도에 비하면 새 발의 피! 어디서 읽으니 완전 재생에는 한 달 정도가 걸린다고 함. 아래 사진에서 보는 것과 같이 원형 대비 소실된 지느러미의 면적을 생각하면 그럴 법도 하다. 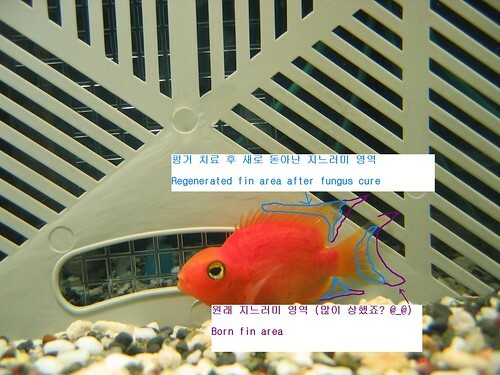 꼭 클릭해 보세요! 여러분도 펑거병 조심하고 즐물! 어항이라는 특수한 환경을 촬영하려는 방법이 있으리라 생각했는데, 시간을 내서 검색해 보니 역시 있었다. 몇 가지는 어느 정도 염두에 두고 사진을 찍어 왔는데, 생각지 못한 사항이 더 있다. 똑딱이로도 가능하다는 것은 또 하나의 희망이다. 옛날 사진을 뒤로하고 이제는 새로운 사진의 세계로! 문제는 물고기가 다 죽어 이제 세 마리 남았다는 것이다. 흑흑. 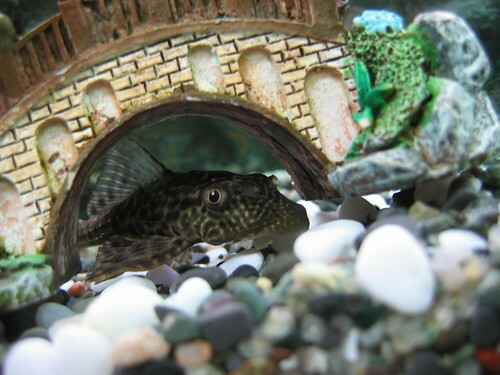 Recently, I recognized that several fishes went inviable in their motion to catch preys and feeds. Dripping several shots of antibacterial liquid was everything that I had done because it had worked well on the same symptom before. One morning after a couple of days, corpses were floating beneath water surface. I came up with the fact that I had forgotten to wash the tank and fill fresh water so long time. It was absolutely my fault not to clean the tank while most of the deceased had lived longer than their known longevity of three years. On the other hand, there is no doubt that the survived also pass away within one year or so regardless of my sincere care. However, the only and very thing that I have to do is still to deliver utmost affection for them. 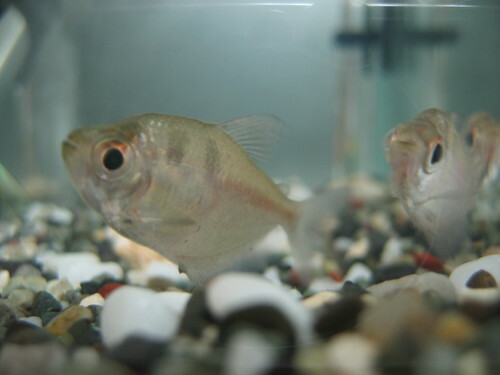 Water tank at home had two new joiners yesterday, a couple of white Corydoras(es?? ), from E-mart. They will stay there with elder inhabitants. White colored one is the variety of original from Brazil. 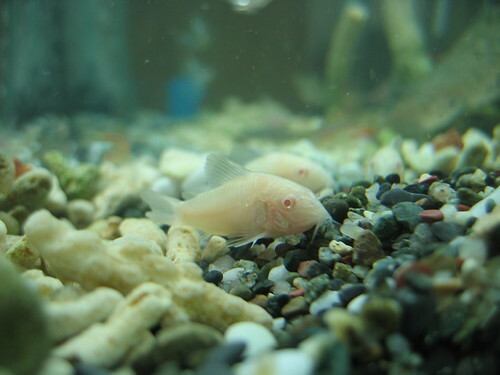 However, they must be bred somewhere in Korea, because the per-fish price is only 1,000 won. Anyway, their presense started to provide the whole water tank with bright hue, whereas striped color mixture overwhelmed it before. Longevity I wish! So many baby fishes had passed away since the start of water tank keeping, while suvivors became doubled in size.